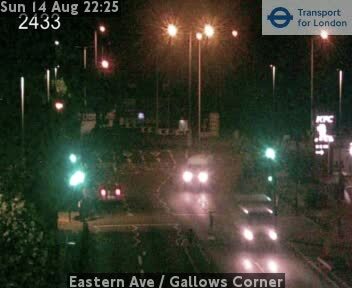 Eastern Avenue / Gallows Corner CCTV | London Traffic Cameras. Traffic jam CCTV images direct from Transport for London (TfL). Avoid congestion on the streets of London with TfL Jam Cameras. Image updated: See image time-stamp. This image is updated every 5 minutes. Please refresh your browser for latest images/video. Traffic delay information supplied by Transport for London, for further details please see: TfL Jam Cams. We DO NOT store any images or video from the CCTV cameras. All feeds are live data and overwritten every 5 minutes. Please DO NOT contact us requesting footage as we cannot supply this. The latest traffic jam CCTV camera images for Eastern Avenue / Gallows Corner. Our travel news is as up to date as possible but please do always check with local news sources and always allow plenty of time for your journey.